Almanac's first shipment of beers landed on our shores in early February. I ended up at the Local Taphouse launch and had alot of their excellent sours! One beer I didn't have was the IPA, a beer that I didn't expect much of considering they are so well known for their sours. I've heard rave reviews about it subsequently, so I sourced a bottle and here we are. If you want to unlock the National Beer Day badge, you better get on it quickly! 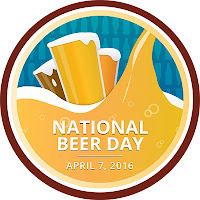 This badge can only be unlocked by checking in to any beer today, April 7th. I'm coming towards the end of Land of the Free, this is Level 48 after all, so you should all know what the artwork looks like by now! It's time to start thinking about what is going to cap off Level 50... Enough about badge artwork and future beers, you're all here to hear about this one; the Almanac IPA. The beer pours that spectacular, clear golden colour that I like my IPA's to look like. The head was slightly off white, trending towards cream, and was quite large (maybe 4 fingers) with a few bubbles forming not long after pouring. The head reduced to a ring of foam by about halfway through drinking, but then hung around for the duration. It also laced the glass quite nicely. A really good start for the Almanac IPA! Onto the nose and it's packed full of tropical fruits and pine bitterness; to call it dank would be an understatement! Accompanying the big hop flavours are quite sweet caramel malts, that admittedly fall into the background behind the cavalcade of hops attacking the olfactory. The taste follows along similar lines to what the nose indicated. It has a slightly sweet, caramel malt base that is overwhelmed by a huge amount of hops. They're mostly resinous pine flavours, but there is also some fruitiness, particularly what I think is apricot and peach, and hints of grapefruit. 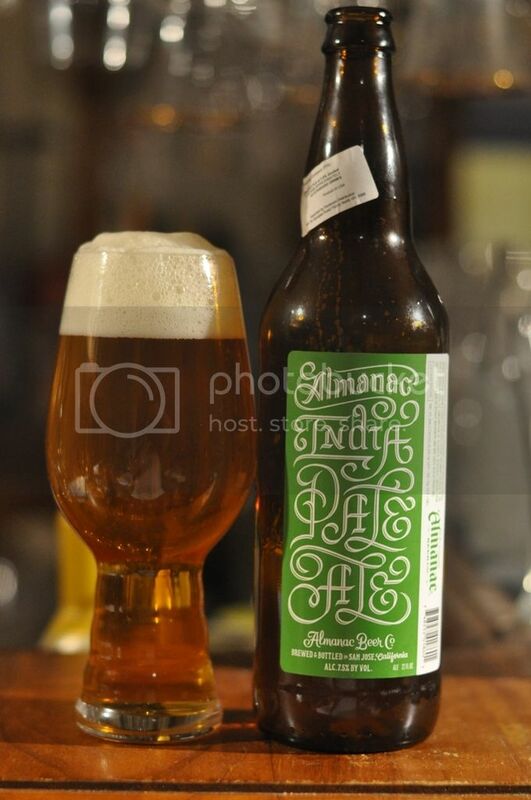 Almanac's IPA blew my expectations out of the water. It's a sensational IPA that deserves far better accolades. I was surprised to read that it only clocked in at 60 IBU's, I thought there was more bitterness present than that. The beer had a wonderful mouthfeel, with it's slightly thick body complimented by slightly above average carbonation. It was a dangerously easy drinking IPA for 7.5%. If you find this beer and love hops, I can't recommend this highly enough, it's awesome!